Whether you're a tech student or a Google aficionado, the new Google Pixelbook is the perfect portable computer! It's the world's first laptop with Google Assistant built in PLUS it seamlessly integrates with Android, Chrome, and the Play Store. We love the sleek, stylish design. Made of lightweight aluminum with a rotating screen, it perfectly captures the 4-in-1 balance: laptop, tablet, tent, and entertainment modes. 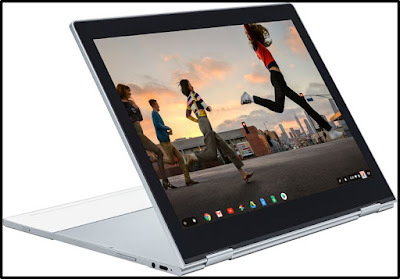 At 10.3mm, Pixelbook is Google’s thinnest laptop ever, with a lightweight aluminum construction that enhances portability, making it great for travel. The 360° touchscreen and versatile 4-in-1 design will seamlessly adjust to whatever you’re doing. Use it for your needs: photo editing, sketching, access to GSuite apps and automatically back up your work and play to your device. It's great both online and offline--enjoy stored movies and your favorite TV shows via apps like Google Play Movies and YouTube Red! The Pixelbook is the first laptop with Google Assistant built in and has several options to activate your assistant. From the keyboard, just use the dedicated Google Assistant key. Or just do it by voice, using the “OK Google” wake word you’re already familiar with. You can even access it with the Pixelbook Pen1 by simply pressing the button and tapping the pen on the screen. From March 25 through April 7, Best Buy is offering $100 off the purchase of a Google Pixelbook! No fans means low heat! Please note, the stylus pen is sold separately. Head over toyour local Best Buy store or go online at Best Buy to check out the total offerings of Pixelbooks, pens, laptop cases, and accessories!